A brief review of our designing – developments and manufacturing history in the automotive field. Our experience in the automotive industry and our involvement with automotive manufacturing, started 41 years ago by Pavlos Kerabos. More specifically in 1975. Pavlos Kerabos, the creator of the project, developer and car manufacturer, is the key of our experience, our technical and commercial expertise. Has holds the largest automotive portfolio in Greece. All his work has been a commercial and aesthetic success, being able to always catch the pulse of every time, and creating the automotive fashion of the times since 1975 in Greece. A project, is not only the design and manufacture. It is everything that the creator is. His character, his knowledge, his insight, the aesthetic balance and quality of origin. The reflection of his personality. Since 1975 he is engaged in car designing, conversions, developments and car manufacturing. In 1977 he establishes the car industry, SAFARI HELLAS producing a jeep style car called Safari with VW engines and mechanical parts. Previously, he contributed to the development of other car industries, entering them strongly to the car market, since their first sale, CITROEN PONY and FIAT automobile Greece. In 1985 he converts and develops, FIAT FIORINO, into a convertible. Making an amazing entrance to the car market with a long sales waiting list. Because this gave the opportunity to ordinary people, to have a convertible car. At that time convertible cars were expensive and it was a luxury. This way people could purchase the cars with a bank loan because commercial vehicles could get 24 months financing, officially. Imagine a light pick up truck turning into a convertible, this was the reason for selling big. People of that generation remembers this very well. In 1990 he modifies MINI COOPER, into a convertible, with special harmonic lines, making an other great history. Also modifies POLSKI Pick Up and POLONEZ Pick Up into King Cabs (double cabin), turning them into extraordinary beautiful cars and the car dealer sold out, all the stock they had for years. In 1992 the design and the fabulous conversion of FIAT CINQUECENTO into a convertible, made him very well known to the Rent a car business, leaving speechless the Italians, who saw the cars to the islands and could not believe their eyes. With this conversion, the cinquecento, had a tremendous success in the Greek islands, with a long waiting list of tourists, wanting to rent them and at double price. He also makes the wooden dashboards for all Skoda Cars of the Greek central dealer. Adding to the cars a different prestige, turning them into an upper class vehicles at that time. With this way ordinary people, who purchased the Skoda cars, had in front of their eyes a luxury car with a wooden dashboard. Other designs and modifications into convertibles were, the Seat Ibiza, the Mazda 121 and Fiat Uno. In 2003 he occupies exclusively with the Smart cars and the field of electronic car tuning and upgrades, with the urge of his wife Stella Kerabos, who had already developed her technical experience in this area. In 2010, he created together with Stella Kerabos, his most recent achievement. The manufacturing for production of the Greek Car “KERABOSS SUPER K”. 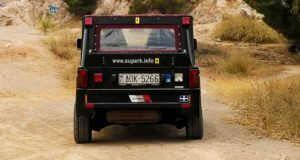 In 2016 “KERABOSS SUPER K” is the first Greek car that got approval. “KERABOSS SUPER K” focuses on a youthful and modern lifestyle, regardless of age. It is something similar to jeans trousers, that can be worn in every occasion. 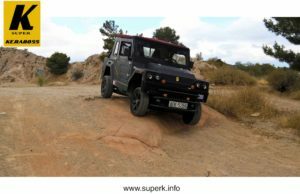 “KERABOSS SUPER K” gives pleasure not only by watching it, but by driving it, for the sport driving fans, with its incredible stability in all conditions. “KERABOSS SUPER K”, is a NEW car and not one more. When you buy our car, you enter a completely different and exciting lifestyle, of freedom, youthfulness, driving pleasure and customizing according to the personality of each owner. It meets every buyer’s profile, giving the suitable different joy. Made to live with it 365 days a year. THE CAR AND ITS DESIGNS ARE PATENTED INTERNATIONALLY BY KERABOSS.